This week Meredith started preschool again, and we’re ALL thrilled! It’s her third year, so it’s familiar but still exciting, and she’s so happy to see her teachers and friends again. Of course, she’s missing the older cohort that left for kindergarten, so that’s a little sad, but she’s learning to fill in for them and play the “big kid” role, helping the new little ones. We were so grateful for the nurturing and sweet care of her friend Karli last year; I hope Meredith can be as kind a friend to some of the younger ones this year. To celebrate, Dan and I went for a tandem bike ride today after dropping Meredith off! What a treat to have the weather and the time to escape for a little mid-day adventure. Don’t get me wrong—I love family outings, too—but riding the bike without hauling our 40-pound five-year-old in the bike trailer is pretty wonderful. And this way, we all get our fresh air and exercise, and then can spend quiet time together when she gets home. I love having the time during the day to do my work, and to prepare for the evening so that I can feel focused and calm about spending special time with Meredith. It doesn’t always happen, but this week, she definitely needs the extra tender loving care—she is worn to a thread when she gets home! Since I had a little extra time yesterday, I could try a new recipe. See what you think! Because I had a little more time today, I had a chance to explore an old cookbook (Noodle, by Terry Durack) for a recipe to accompany the baby bok choy we’d traded Mr. Stockwell for our kalamata olive bread at the Saturday Farmers Market. I ended up deciding on a spicy peanut noodle recipe. Of course, I made a complete mockery of his recipe, adding way more veggies than was called for, and substituting pantry ingredients for unknown Asian ones. Even though you probably already have your favorite peanut noodle recipe, consider trying this one. It’s different because I’ve used at least equal parts (if not more) mung mean sprouts to cooked noodles. But you can’t really tell because the sprouts are noodle-shaped, and coated with the yummy sauce! Lightly blanched, they add a great crunch to the softer bite of the noodles, and they make the dish lighter and healthier! This dish is fantastic at room temperature, too—so you can make this for a potluck or eat it cold for leftovers. When I made this, I made a double batch of the sauce to make sure I had enough for all those bean sprouts. I think you’ll be fine with a single batch, but since it makes such great leftovers, why not make a double batch anyway? 1. Bring a pot of water to a boil and add a couple of tablespoons of salt. 2. In a medium bowl, mix the peanut oil with grated ginger and sugar. 3. Blanch bean sprouts in the boiling water, and scoop them out after a minute, letting them drain and cool. 4. Toast the sesame seeds in a dry pan just until they start to brown. Crush them lightly in a mortar and pestle. 5. Add the chili oil (or cayenne), sesame oil, peanut butter, water and toasted sesame seeds to the ginger and oil mixture and whisk to combine. Add the soy sauce, vinegar and pepper, whisking again. Taste and add more soy sauce if you like. 6. Cook the noodles in the boiling water until they are done to your liking. Drain them, put them in a big bowl, add the bean sprouts, and toss them immediately with enough sauce to coat everything nicely. Add more sauce to your taste. 7. Plate each serving alongside a vegetable (like the baby bok choy) and top with a generous sprinkling of scallions. 1. Trim the bottom ends off each boy choy, take them apart and slice the leaves lengthwise into halves. 2. Heat the oil over very high heat and sauté the garlic until it becomes fragrant, about 30 seconds. 3. Add the baby bok choy leaves and ½ teaspoon of salt and sauté until the leaves are wilted, stirring to get the garlic up off the bottom of the pan so it doesn’t burn. 4. If the leaves are all wilted and the pan is dry, but the stems are still very crunchy, add ¼ cup water, cover the pan, and let the leaves steam until the stems are tender. Add more salt to taste, and serve. 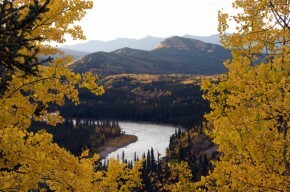 Maybe you’ve already read that we just got back from the most amazing fall color display on our trip to Denali. (See a couple of Denali photos at the end of this post by our friend Peter Polson!) Still, the colors right here in Anchorage are pretty spectacular, too! I was running on the Hillside trails the other day, and loving the contrast of the red bearberry and dogwood, the golden birches, and the bright green mosses. Are we lucky to have this kind of beauty all around us, or what? But my thoughts generally wander from such high-minded topics, and as usual when I’m running by myself, I started to think about food. In this case: the menu plan for the week, what needs cooking out of my refrigerator, and specifically, what I could make with bright color contrasts and fall vegetables. I admit that bearberry leaves aren’t purple, and this salad lacks a birch gold, but I wasn’t trying for an exact match on the color scheme. This cabbage salad gets serious points in my book for fantastic color contrast (not to mention its delicious taste and speedy preparation)! You can still pick up bags of sweet, fresh peas at the farmers market, and of course Alaskan red cabbage is ubiquitous this time of year. Selling bread yesterday at the farmers market, it was cool and rainy… it’s definitely turning into fall, after this wonderful warm weather we’ve been enjoying! This is a recipe that I adapted from one that my friend Colleen gave me. Hers used radicchio and cider vinegar, but I didn’t have any radicchio—so this salad was born! If you don’t have red cabbage, you can use green cabbage instead. It’s pretty, still, with the different colors of green. Since this is a wilted salad, but the cabbage still retains some of its crunch, it’s great as a leftover salad the next day. I love eating this salad as a side to an avocado toast with balsamic vinaigrette and pickled red onions. 1. Put the cabbage and scallions into a large salad bowl. 2. Combine all vinaigrette ingredients in a small saucepan. Bring to a simmer to dissolve the honey and salt. Add the peas to the vinaigrette and cook for 1-2 minutes (maybe a bit longer if the peas are still frozen), just long enough to warm and cook the peas a little bit. Don’t cook them so long that they start to turn grayish-green; this is just to infuse them with the vinaigrette and soften the skins a little. 3. Pour the hot dressing and peas over the top of the cabbage and toss to mix well. The dressing will wilt the cabbage a little. Taste and add more salt, pepper, and honey as needed to make a vibrant salad. We’ve just returned from an incredible trip to Denali… and I hardly know where to start. We have a camping journal that we use to record our adventures, and in nine days I wrote 18 pages. Don’t worry, I’ll give you the abbreviated version! When we left Anchorage ten days ago, it was cloudy and cool, and just kept getting cooler as we drove north to Denali State Park. Despite the overcast skies, we were astonished and delighted by the fantastic reds, yellows, and lime-greens of the foliage as we drove north. We had clearly struck peak color! We spent three mostly rainy days at the State Park, enjoying hiking and running on the Little Coal Creek and Byers Lake trails, road biking along the highway, and canoeing on Byers Lake and watching the spawning red salmon. Then we headed north to Denali National Park, and headed in to the Teklanika River campground for three days. We were thrilled when the weather seemed to be brightening… and then it just kept getting better! All three days in the park were completely cloudless, and on the first day, our ride into Eilson Visitor Center on the Park bus showed us The Mountain from tip to toe in all its astounding glory. We were also lucky enough to see a wolf, two bears, some faraway sheep, and a couple of caribou. Subsequent days were even more magical, with fantastic bike rides in the park pulling Meredith in her bike trailer (Thank goodness we have a tandem bike, so we can pull the trailer together! ), beautiful hikes and runs, and slow, lazy days in the sunshine, admiring the bright leaves against the backdrop of the blue, blue sky. 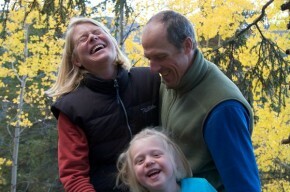 The last three days we spent with our friends Shannon & Peter at their cabin just outside the Park. Our unbelievable luck continued, and the weather held, clear and sunny, freezing at night as the full moon beamed down on us. More hiking, biking, and running; more lazy, slow days; plus the pleasure of great conversations and meals with our friends. The reason I’ve included this particular soup recipe is that it’s one of the meals I brought along with us on our trip. To feed us on our ten-day journey, I froze a lot of soups and stews, packed a very large cooler full of them (plus bread, of course), and then slowly thawed them out over the course of the trip. By the time we hit Shannon & Peter’s cabin, this soup was perfectly ready to eat! We shared many meals, but this was one for which they requested the recipe. Thanks, Shannon & Peter, for a fantastic three days, and for inspiring us to come north for our last camping trip of the summer!! I think you’d have to be crazy to make a single batch of this recipe, since it freezes so well, and because it’s SO DELICIOUS and it tastes even better the next day… In fact, if you make it the day before, and saute up a pile of fresh chard with garlic to put in it right before you eat it, I’m betting you’ll swoon with joy. I think this might be the best soup I’ve ever made. But anyway, about the double batch… it does take a pretty large pot, so do what you think is best. And then go out and buy a REALLY BIG POT (with a heavy, stout bottom) for next time! This recipe is loosely based on one from a recent Cook’s Illustrated magazine. The interesting twist that they’ve found to get really tender, perfect white beans is to soak the beans in salt water! I was really excited to try this, because often times my white beans don’t come out perfectly. Some will be disintegrating and others in the pot will be hard and crunchy still, or have hard, tough skins. This brining the beans really works! I’m completely sold! The other key to perfectly beautiful beans is to keep them from boiling hard, which tends to explode the beans. So you cook the beans over very low heat. The Cook’s Illustrated people do it in a 250 degree oven, but I think it works just fine in a big, covered pot in the stovetop, turned way down so the soup is just barely bubbling. 1. Rinse the beans in a colander. Dissolve 3 tablespoons salt in 4 quarts cold water in large bowl or container. Add beans and soak, at room temperature, for at least 8 and up to 24 hours. Drain and rinse well. 2. Place mushrooms in a heat-proof bowl and pour boiling water over them to cover. Cover the bowl with a plate so it stays hot, and let sit for at least 10 minutes, while you chop the vegetables. 3. Pour the mushrooms through a fine-mesh strainer lined with cheesecloth (saving the liquid! ), then lift mushrooms out of the strainer and mince them. Set mushrooms and liquid aside. 4. Heat oil in large soup pot or Dutch oven over medium heat until shimmering. Add onion, celery, and carrots. Cook, stirring occasionally, until vegetables are softened and lightly browned, 10 to 16 minutes. Stir in garlic and cook until fragrant, about 1 minute. Stir in 8 cups of water, bay leaves, soaked beans, and reserved mushrooms and their cooking liquid. Increase heat to high and bring stew to simmer. Turn the heat down, cover the pot, and keep the pot at a bare simmer (you’ll have to take the lid off and check occasionally) until beans are tender, 40 minutes to 1 hour, or longer, depending on the age and type of bean. 5. Stir in the tomatoes and their juice. 6. Strip the rosemary leaves off their stems and chop them very, very finely. The easiest way to do this is to pulverize them in a coffee grinder. It really works! Stir the rosemary in, too. 7. Taste the stew for salt, and add as much as needed to perfectly flavor it. Add pepper, too, to taste. After the soup sits, you may need to add more salt. 8. If you’re making the soup ahead (my recommendation—it always tastes even more divine then), just let it cool and refrigerate until the next day. 9. When you’re ready to eat the soup, prepare the greens. Trim the stems from the leaves and chop them into 1-inch pieces. Sauté them in a pan in a little olive oil and a sprinkle of salt (add minced garlic, if you like) over medium-high heat. If you’re using mature kale or collards, after you’ve wilted the leaves, you’ll need to add ½ cup of water or so and cover the pan, letting the leaves steam and simmer until they are completely tender. The chard will cook much more quickly, and probably won’t need water added. Add salt to taste as you cook them. 10. Reheat the soup if it’s not already hot, and decide if you like the consistency of the soup. Do you want to add more liquid? Just add a bit more water. I like it soupy, while others may like it more like a stew. Do what seems best to you! 11. When the greens are tender, stir them into the stew, taste once again for salt and pepper, and serve. This soup is fantastic served with hearty sourdough whole-grain bread or toast, dipped in some really nice extra-virgin olive oil.